This guide to peas has all the information you need to know about spring peas including a bunch of pea recipes to try out yourself! 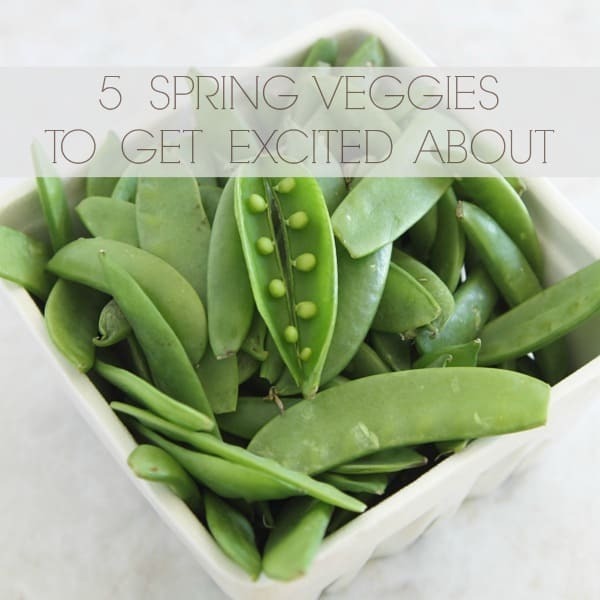 Here we are at the last spring veggie to get excited about…peas. I used to tell people that I liked all vegetables except these green little guys. Reality though is that I just didn’t enjoy the mushy overcooked canned peas my mom used to put on top of her meatloaf. Admittedly, that dish didn’t really give them a fair shot. That combined with the one and only asthma attack I ever had at about 7 years old the night she made a shrimp and snow pea stir-fry…I was a bit turned off from the whole pea family. Luckily, like my aversion to fish and eggs, I eventually outgrew the pea hate to a point where I’m now praising the bright green spring vegetable in this guide to peas. Peas are pretty versatile. I buy sugar snaps for snacks in the spring and love dipping them in hummus. Snow peas are a great addition to a quick 1-pan, stir fry kind of meal. And while I love the idea of buying fresh shelling peas from the farmer’s market to shell myself, I really don’t have the time for that and just keep a bag of frozen shelled peas on hand instead for a quick green addition to soups, stews, pasta, rice and other grain dishes. Pea season generally runs from April until July. Shelling peas, sugar snap peas and snow peas are the ones we’re all familiar with. Shelling peas are great in pasta and rice and what’s in that frozen bag from the grocery store. Sugar snap peas are the flat ones and snow peas are the more plump, both are common to stir-fries. Shelling pea pods should be glossy, firm and feel full. Sugar snap peas should be crisp. Snow pea pods should be flat without any visible bumps in the pod. Peas should be eaten as soon as possible after purchase as they lose their sweetness quickly. Store them in a tightly wrapped plastic bag in the refrigerator for only a couple of days. If using shelling peas, wait to shell them until right before cooking. Sugar snap are great raw for a fun crunch, shelling peas are great in pasta, rice and soups and snow peas are perfect for stir-frying. However, all can be sautéed, steamed or boiled. 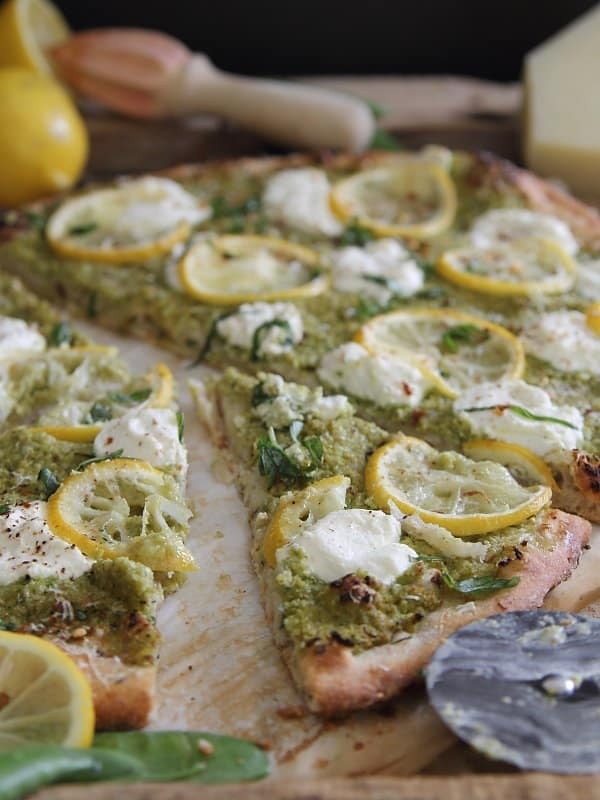 Peas are a starchy vegetable high in fiber and vitamin K.
Spring pea and lemon pesto pizza – This pea and lemon pesto pizza is dolloped with ricotta for a light pizza to celebrate spring. 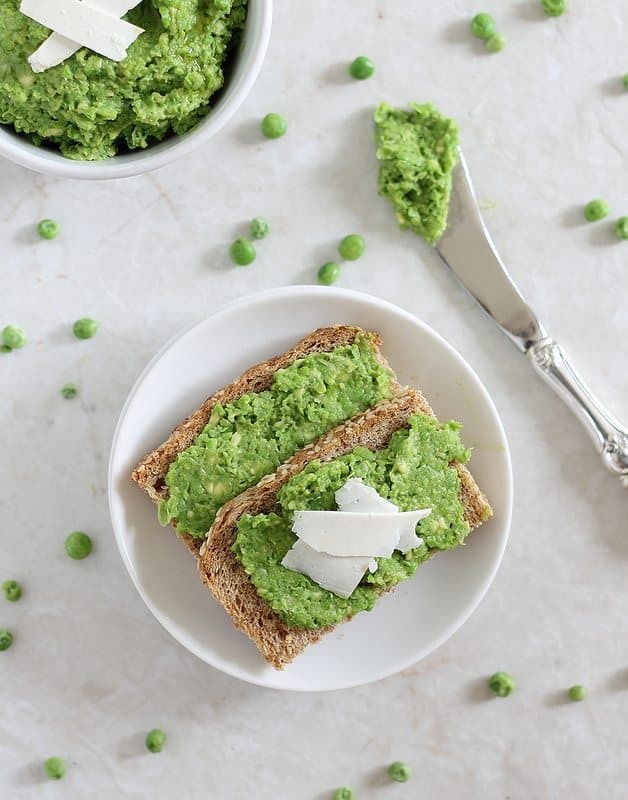 Minty pea and avocado spread – This minty pea and avocado spread is great as a pesto, dip or spread. 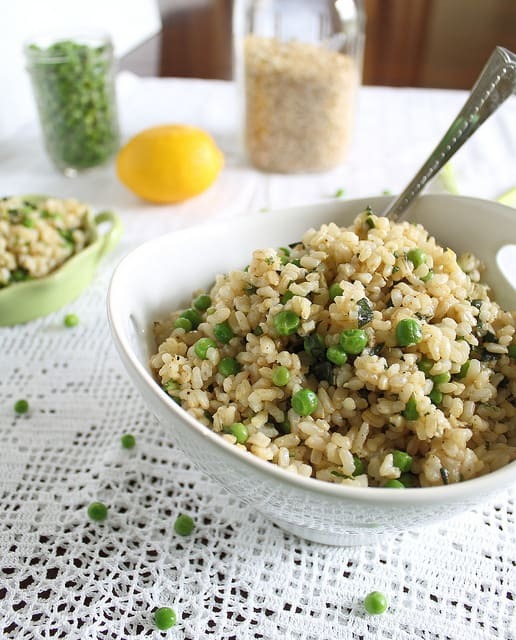 Basil brown rice with lemon and peas – The basil brown rice with lemon and peas dish is an easy side full of spring flavor and great for weeknight meals. 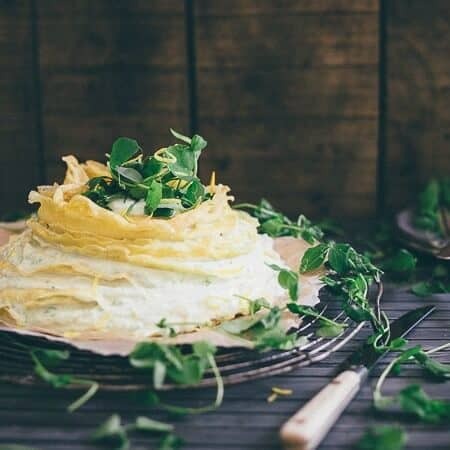 Sweet Pea Lemon Crepe Cake – This sweet pea lemon crepe cake is made with grain free crepes and layered with a sweet pea, ricotta, lemon and creme fraiche filling making it the perfect spring dessert! 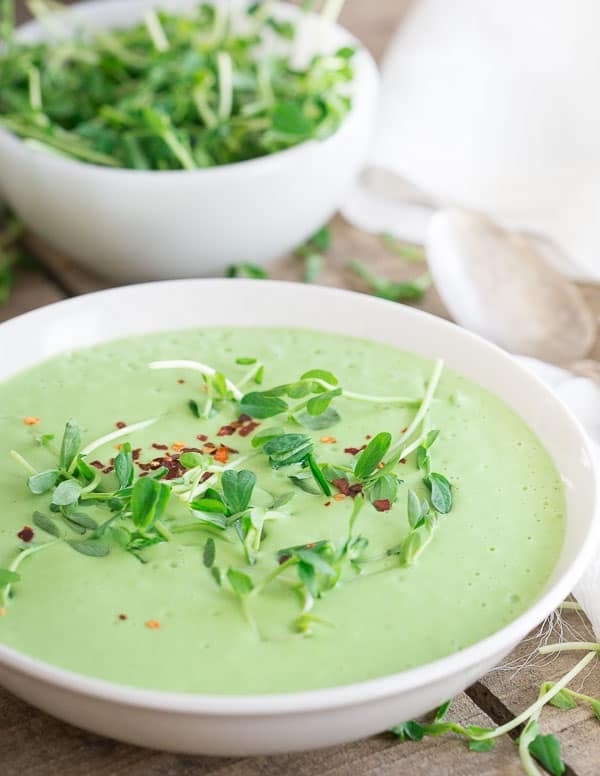 Thai Pea Soup – This Thai pea soup is made completely in the blender and full of fresh spring flavor. With ginger, lemongrass, coconut milk, jalapenos and peas, you’ll want a big bowl. I love peas. I love to eat sugar snap peas raw the most, but I add regular peas to just about anything. Love the beautiful green color! I used to feel the same way about peas, but it was the way they were prepared, cooked to death. Nicely done. I love using peas in potato and tuna salads because they brighten up the dish with color and flavor. I also use them in rice dishes and in casseroles. How fun is this post? I can’t tell you how excited I am that Spring is finally here and we can have fresh veggies again!! Pinning so I can come back later and check out all of these links. Thanks!! Yum! I love peas. They’re one of my favourite spring foods. So sweet. I could eat them straight-up! Minty pea and avocado spread??? I think I need that right now. Then I read this in your post: Reality though is that I just didn’t enjoy the mushy overcooked canned peas my mom used to put on top of her meatloaf. I’m happy I also outgrew the food aversions I developed as a kid.